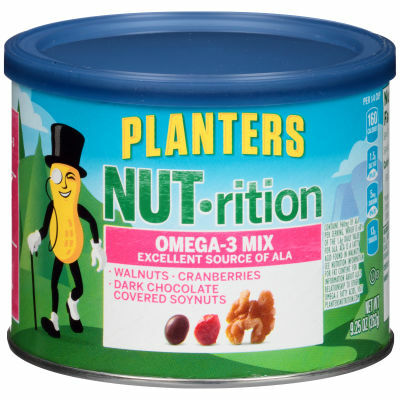 Planters NUT-rition Omega-3 Mix is a delicious chocolatey, fruity and nutty mix rich in omega-3 ALA fatty acids - Very low in sodium, free of cholesterol and trans fats, this NUT-rition mix is an excellent source of omega-3 fatty acid ALA. The walnuts, cranberries and dark chocolate covered soy nuts combine to give you a unique taste profile in every healthy bite. Available in a 9.25 oz. canister, this mix is great for grabbing a quick snack you can feel good about eating.